Editor’s Note: This week we continue to feature the positive impact corrections professionals have on their communities. When we asked for stories we received a variety of wonderful essays from states nationwide, including Nevada, Alabama, Oregon, South Carolina, Rhode Island, Florida, and many more. In the final part this week we continue these stories. She is also Vice President of the American Legion Auxiliary in Hampton, and a Gold Star Mother and founder of an online Gold Star Families Support Group. The Blue Star Mothers consist of mothers and family members who have lost a child or family member in the military. Gold Star Mothers are those who have lost a child in the war. Ms. Rivers lost her son, SPC Harry (Buck) Winkler III, when he was killed in Samarra, Iraq on November 12, 2006 during his second deployment. Rivers and other members raise money to help support the troops in war by sending cards and packages. A huge "Support a Soldier" yard sale, silent auction, raffle, car wash and bake sale was held in November 2007, to raise money for shipping packages to those service men and women serving in Iraq and Afghanistan, and on December 1, 2007, 202 packages were mailed. In addition, she monitors a support group which crosses the United States to those families who are coping with the loss of a loved one to war. They share pictures, stories and talk about ways they are healing. Rivers has personally talked to families all over the U.S. and has worked to bring them together where they can meet each other and talk. Currently, her local group is working with 75 families who have lost either a son or daughter in Afghanistan or Iraq since 2002. Program Assistant Brenda Barnes is a tremendous asset to her community. Her proficiency and excellence does not in any means stop when she clocks out for the day, it cascades in all of the differences that she makes. She has served as a poll manager for the past election for mayor of the North Charleston Primary, making sure everyone knows how to use the voting machines, and helping with any questions or concerns voters may have. She will continue this next year with the presidential election. Barnes is also a juvenile arbitrator. This entails the youth of our community that have committed crimes to go before her instead of serving jail time, This gives them a chance to right the wrong they made against the community by performing community service or other sanctions. This is something she does after work, with no pay. She performs this to make a difference in these kids life. She is very active in her church community. Not only does she serve on the usher board, but she also serves on the Missionary Society where she visits sick and shut-in members and gives them encouragement. The society also assists with preparing breakfast one Saturday a month at local orphanages. Barnes helps educate our church community about the adoption process, and she serves on the Talent Scholarship committee, where a pageant is organized to award a deserving young lady additional funding for college. She even finds time to baby sit her loving grand daughter when her daughter works. Program Assistant Barnes is truly a blessing in the community. Larry Yarbrough is a carpentry instructor at Tyger River Correctional Institution in Enoree. When not at work, he has been serving as an adult worker for the past sixteen years with the Salkehatchie program, which is sponsored by the United Methodist Church. Yarbrough has also worked on numerous one day mission projects and has worked on four mission projects overseas during this time. The Salkehatchie program involves a church sponsoring a camp for teens from different counties to attend for one week. The teens and adult workers work on projects ranging from adding bathrooms to homes and roofing homes to flooring rooms and painting. Participants pay to attend the camp, which help pay for building materials, and provide their own tools and equipment. The sponsor church provides group housing and arranges for meals to be provided. Yarbrough says he enjoys attending the camps and assisting others. He most enjoys seeing the teens realize that they have helped others in need and seeing the satisfaction they receive from their accomplishments. He feels this service impacts youth throughout their life. Aboud Saggal, a CO at the Donald J. Price medium security facility, came to the U.S. from his native Sudan, Africa, at the age of 13. Though his father died young, at age 57, he always told Aboud that he should teach his children to work hard and give back to the community in appreciation for the riches with which they have been blessed. Saggal has done just that as an Assistant Scout Manager with Boy Scout Troop 22 in his hometown of Johnston. He has been involved with scouting with his sons, now ages 12, 14, and 17, for at least 10 years. As Assistant Troop Leader, Saggal leads the troop on camping trips and field trips, including a recent visit to the Freedom Trail in Boston. A highlight for the troop has been visits to Maximum Security where they have participated in the Department’s S.C.O.R.E. program, wherein a panel of inmates talks to high school and middle school youth about making the right choices. 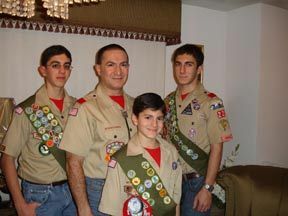 The troop is considering a big trip to some place like Washington, D.C.
Aboud feels that scouting has had a positive impact on his children and their development. Senior Research Technician Ann-Marie Bandieri is president of the Society of Saint Vincent de Paul at St. Raymond Church in North Providence, which includes 35 members and has been serving the community and those in need for the past 76 years. Bandieri manages a core team of St. Vincent volunteers who work at the Rhode Island Community Food Bank. Bandieri also helps unpack cases of food and stock shelves with fresh fruits, vegetables, and health and beauty aids. She and other volunteers recently renovated the food pantry, which allowed for more shelves and a long table for receiving cases of food and packing grocery bags. She also writes grants for donations and for equipment (i.e. freezers, refrigeration unit) and children's/women's health products. Bandieri works on a food distribution team that serves about 125 families per week. Richard Delfino, an assistant administrator for Probation & Parole, has long been active in his Johnston community. He is Chair of the Johnston Substance Abuse Coalition Task Force, and for the past 15 years has been a member of the Tri-Town Community Action Agency Board of Directors. 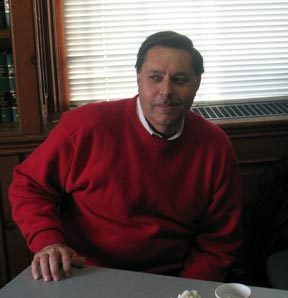 He was a member of the Johnston School Committee, for which he served three four-year terms, and he is a former member and chair of the Johnston/Smithfield Regional Juvenile Justice Hearing Board. He also received the National Youth Sports Council Association RI Coach of the Year. Jefferson Chesson is a home confinement counselor for the RIDOC, and is a well known and respected member of his community. He serves as chair of the Board of Directors of the Liberian Community Association of RI, which is a community based non-profit, volunteer organization that caters to the needs of all members of the Liberian community. It assists with immigration issues and/or problems of community members. Since the 1990s, Chesson’s organization has spearheaded immigrations efforts of Liberians who fled their homeland and have been arriving in America from refugee camps. Chesson also is a member of the Board of Directors of the Union of Liberian Associations in the America (ULAA), and umbrella organization of all Liberian community associations in America. He is also the editor and publisher of The Pepper Bird Magazine and producer and director of The Pepper Bird Magazine’s Public Access Television program called “Africa Teach-In”. The Pepper Bird is a non-profit community-based magazine that serves the African and African American communities. Martin Davis, Principal Planner for Planning and Research, is very active in Men2B, a training program for men who want to be better role models to young men and boys. Men2B teaches men how to help adolescent boys make good decisions and become healthy adults. “Many times the men we train to be role models are released offenders from RIDOC, former gang members, and men residing in struggling socioeconomic Rhode Island communities, as well as community activists who are citizens in good standing,” Martin says. Davis also is a member of the newly formed Men2B/Mentoring Leadership Team. He provides role model training throughout the state, in the RIDOC’s Maximum Security Facility, the Rhode Island Training School, and at his local church, where he serves as Deacon and Moderator. In June 2007, COI Bobbie Jones asked about creating a program similar to “Shop with a Cop” program and inviting the local County Sheriffs and Police Departments to help out. The committee met for the first time in September 2007 and from that meeting the “Officers for Youth” program was formed. The committee is made up of eleven MODOC staff members, the Dekalb County Sheriff and Cameron Police Department. They groups has held fundraisers, like cookie and pizza sales, , and called on numerous local business and groups to raise funds. Their efforts gave more than 25 area children the opportunity to visit Santa, eat a meal, go shopping with an officer (with $100 each to spend), and see a movie. “Officers for Youth” intends to continue the “Christmas Shopping” program along with funding a “Back to School with Pride” program, which will provide new clothing for children returning to school in the fall. When Jamie Wilcox first called to ask for help from the Forestry Crew to build a playground, it was winter. The scope of vision the playground committee was amazing, and the sheer enormity of the task at hand was an eye-opener. But, the WHF Forestry Crew went to work at every assigned task with their normal confidence. The volunteers were amazing with their coordination and logistics ability. 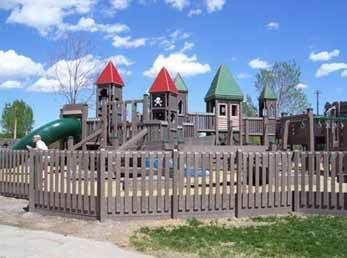 With the help of all the volunteers and the Forestry Crew, the playground was completed on schedule.